In 2013, Stanford went to the Rose Bowl, and their band made people upset. In 2014, Stanford went to the Rose Bowl, and their band made people upset. In 2016, Stanford went to the Rose Bowl to play the Iowa Hawkeyes, and guess what happened at halftime when the Hawks were down 35-0…. They didn’t explain what the cow was — it just kinda walked around — but Iowa people sure hated it and booed. Thanks to Pete Cuomo and Kebmodee for bringing this to the attention of the It’s Interesting community. You don’t have to be a superhero like Spider-Man to climb on walls. 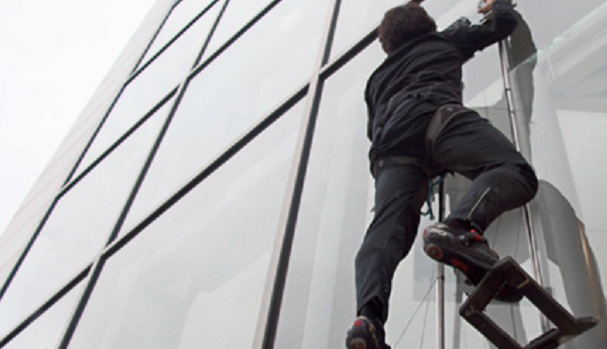 Researchers have developed “Gecko Gloves” that can help humans climb on glass walls. The Gecko Gloves have been created by Elliot Hawkes, a mechanical engineering student at the Stanford University. The gloves have very similar scientific principles as found in the sticky toes of geckos. Hawkes reveals that he is working with a group of engineers who are developing reusable and controllable adhesive materials that can bond with smooth surfaces such as glass, but also release with the use of minimal effort. With the help of the synthetic adhesive, Hawkes and his team created a device that can enable a person to climb on glass walls. Hawkes explains that each gecko handheld pad is coated with 24 adhesive tiles. Each tile is covered with sawtooth-shape polymer structures, which measures about 100 micrometers long, or about the width of a normal human hair. The handheld pads are also connected to degressive springs that become less stiff when the pad is stretched, which means that when the springs are pulled they apply similar force to the adhesive tiles and causes the sawtooth-like structure to flatten. When the load tension is released it reduces grip. Some experts suggest that the Gecko Gloves can be applied in many fields. It can be used to manufacture robots, which carries glass panels. Mark Cutkosky, who is the senior author of the paper, suggests that they are also working on a project with the U.S. National Aeronautics and Space Administration (NASA), which will involve applying the Gecko Gloves to robotic arms of a spacecraft. With the help of the Gecko Gloves, the robotic arm will be able to catch hold of space debris like solar panels and fuel tanks and move it accordingly. Researchers of the latest study suggest that previous work of gecko or synthetic adhesives showed that adhesive strength is reduced when size increases. However, in the Gecko Gloves, the springs make it possible to sustain the same adhesive power at all sizes ranging from a square millimeter to the size of a human hand. The latest version of the Gecko Gloves can support around 200 pounds, or about 90 kilograms (kg). However, if the size is increased by 10 times it can support about 2,000 pounds, or 900 kg. The research has been published in the journal Royal Society Interface.